When you use our services, you are partnering with a winner! Shipping your furniture with Shelba D. Johnson Trucking, Inc. assures you of the best service available in our delivery areas, which includes the entire eastern United States and Texas. Our objective is to deliver your freight in a timely and pristine manner, helping you manage your space requirements while completing your sales and maximizing your cash flow. Shelba D. Johnson operates out of two terminals in Thomasville and Archdale, NC. We operate over 180 trucks in our fleet for both pick-up and delivery. We also manage an additional 80 dedicated owner-operators for deliveries. The over 500 trailers in our equipment fleet are air-ride equipped for smooth and damage-free movement. Joe Wade is the owner and president of SDJ Trucking, Inc. He believes in treating his customers the way he would want to be treated. We have built our organization on customer service, recognizing customers need a long-term relationship with a carrier to ensure the efficient flow of product from manufacturer to retailer. 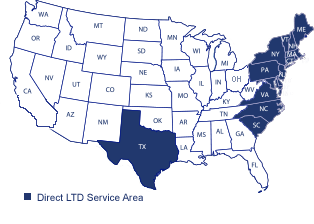 We have continued to grow over the years and currently offer furniture manufacturer and distributor pick-up in a number of states, including states outside our traditional service areas. Through strategic partnerships, we are offering wider sourcing of furniture across the United States with corresponding deliveries as well.